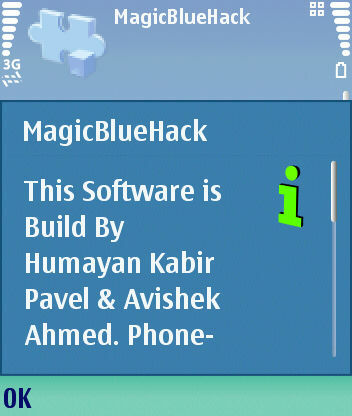 Magic Blue Hack for Mobile is build by Humayan Kabir Pavel and Avishek Ahmed. By using this Software on your mobile you can access another Bluetooth mobile such as make Call, Send SMS, Read Phone Book and Read SMS Inbox from another Mobile without notifying him by Using Mobile Bluetooth Technology. MagicBlueHack for Mobile may ask for permission to start Bluetooth service with another for first time. By using this Software on your mobile you can access another Bluetooth mobile. Qweas is providing links to MagicBlueHack for Mobile 1.0 as a courtesy, and makes no representations regarding MagicBlueHack for Mobile or any other applications or any information related thereto. Any questions, complaints or claims regarding this application MagicBlueHack for Mobile 1.0 must be directed to the appropriate software vendor. You may click the publisher link of MagicBlueHack for Mobile on the top of this page to get more details about the vendor.